To the delight of Aurora watchers Earth’s magnetic field vibrates in protest of unrelenting solar wind. An Earth facing hole of monstrous proportion opened on the Sun, belching winds of 600 Km/second (that’s almost 1.2 mph ) toward our planet. 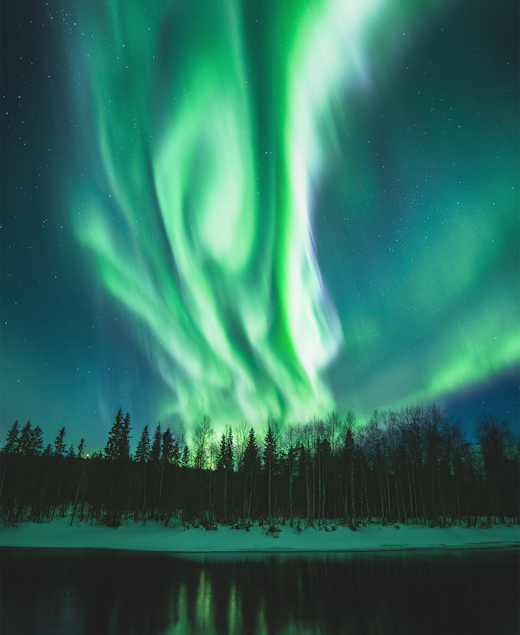 Defensive vibrating twists in Earth’s magnetic field ignited powerful geomagnetic storms. Astronomers predict intense aurora activity to continue for several days. 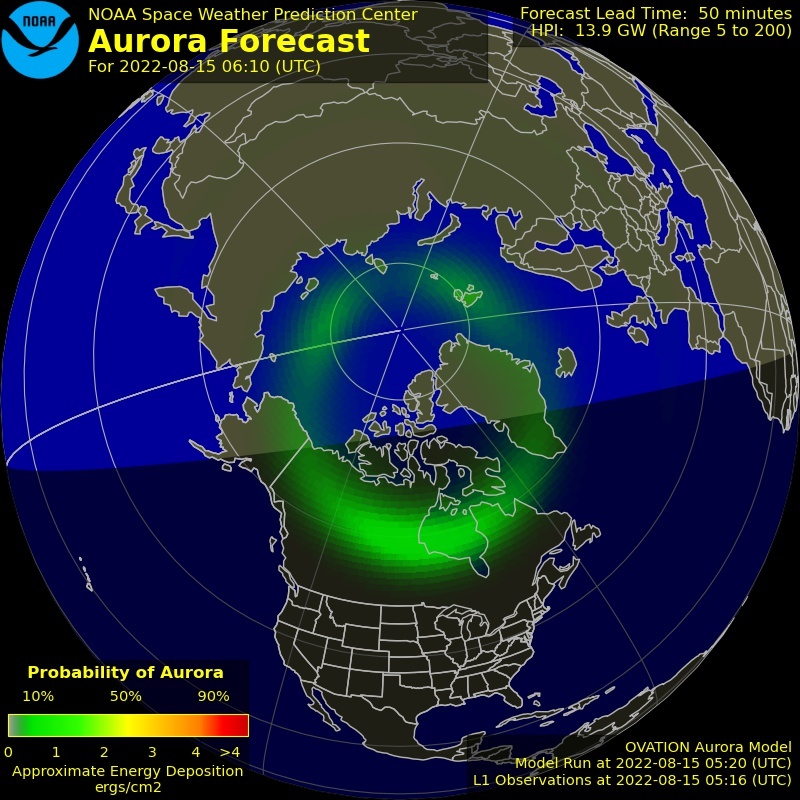 The current auroral oval commands the Northern Hemisphere. Anyone living under the oval owes it to themselves to look up under clear dark skies. Those lucky enough to meet Aurora, embrace her stamp of indelible wonder. She’s waiting – all you have to do is find her. Beginning September 10, 1941 astronomers noticed a particularly active cluster of sunspots. Over the next week they blossomed, reaching magnitudes visible to the naked eye. For seven days the disturbance grew, drifting with solar rotation until they faced Earth. Seventy five years ago today they erupted, resulting in a solar event known as the geomagnetic blitz of 1941. Assertive auroras danced from New Mexico to Chicago, New York and Washington DC. The Chicago Tribune wrote “a cosmic brush painted the Chicago sky with light”. Auroras across Europe were described by press in context of the war – illuminated by geomagnetic light, the British Royal Air Force bombed a German supply base on the Baltic Sea, and German forces stormed besieged Leningrad. Betrayed by aurora’s light, German aircraft attacked a convoy of Allied supply ships. “Kapitänleutnant Eitel-Friedrich Kentrat of U-74 recorded the ensuing events in his war diary [Morgan and Taylor, 2011, pp. 119–123]: “September 18, 1941, visibility 4–6 nautical miles, a number of smoke plumes on the horizon, vessels seem well strung out.” Kentrat had spotted SC-44, a Canadian convoy of cargo ships. For protection, a destroyer and small antisubmarine warships known as corvettes escorted SC-44 along its journey. A wartime convoy would normally have been relatively securely hidden in the dark of night. But not this night. At 22:30 UT, Kentrat issued a radio dispatch to headquarters and the other Brandenburg U-boats, “Alpha. Alpha. Enemy convoy in sight. Quadrant AD9761. Course NE, moderate speed. U-74.” Unsure whether his compatriots received his message, he recorded in his diary that since 04:30 UT on 18 September, “short-wave radio reception has been very poor and it gradually cuts out altogether. We try absolutely everything but without success. I hope the other Brandenburg boats can receive me.” Unbeknownst to Kentrat, his radio problems were caused by the magnetic storm and the ionospheric disturbance that followed. As the Sun set, the sea haze lifted. Under such conditions, a wartime convoy would normally have been relatively securely hidden in the dark of night. But not this night. The sky was ablaze with the aurora borealis. Kentrat described the conditions as being “as bright as day.” Ironically, in a postwar interview [Johnston, 2008, p. 38], a crewman on board a ship in the convoy, the SC44 corvette HMCS Lévis, recalled seeing the aurora on that evening and remarking to a fellow crewman, “What a night for a torpedoing.” This bit of dark humor would turn out to be prophetic. 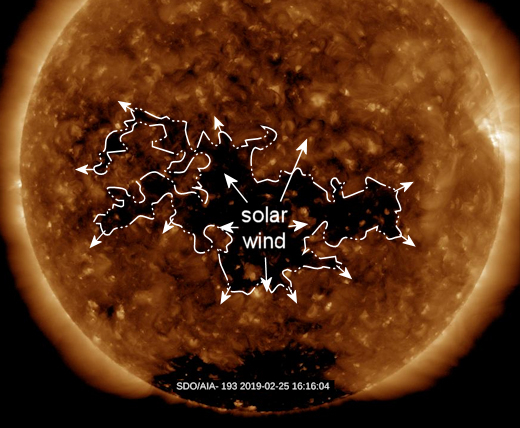 As I write tonight, solar winds unleashed from a wide Earth facing coronal hole are expected to reach Earth by September 20. Science predicts geomagnetic storms over the next few days. Other than brilliant high latitude auroras, it isn’t likely many will even notice. Nor is it likely a cautionary tale of the Geomagnetic Blitz of 1941 will register as anything but a page in history. In my mind, space weather events are the least known, least taught and least acknowledged. I don’t get it. Over and over again, irrefutable accounts of solar assaults languish in obscurity. SDO (Solar Dynamics Observatory) changed how we ponder our Sun. Launched on February 11, 2010, SDO became NASA’s first solar observatory. No larger than a minivan, purposeful and dedicated, SDO’s singular objective is to understand how solar activity impacts Earth. Instruments measure the Sun’s interior, magnetic field and plasma of the solar corona simultaneously – one mission, to understand space weather in relation to Earth and near-Earth space. Space weather refers to the effects of solar wind on Earth’s magnetosphere, ionosphere and thermosphere. Conditions attributed to constant flows, punctuated by violent eruptions of solar plasma – charged particles, flung outwards from the Sun at speeds up to 1 million mph. Auroras, mesmerizing spectacles driven by clashes with solar plasma appear innocent enough – space weather has far greater ramifications. Solar wind driven plasma is responsible for bending or obliterating radio waves, disrupting navigation systems, forcing airplanes to change course, decayed orbits of satellites, temporarily knocking out cell phone service and complete failure of power grids.During an intense geomagnetic storm in October of 2003, 46 0f 70 spacecraft failures were attributed to space weather. In March 1989, 3 minutes after impact of a severe solar storm, Quebec’s power grid was annihilated for 9 hours.